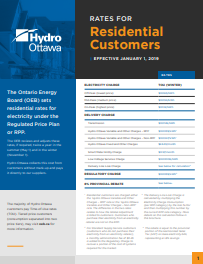 Effective January 1, 2019 electricity rates remain unchanged for Regulated Price Plan (RPP) customers. The majority of residential customers are on the RPP. These rates are set by the Ontario Energy Board. Notice to our customers: As of January 1, 2019 the Delivery Charge has changed. The total monthly bill for a typical residential customer consuming 750 kWh per month increased by approximately $0.12 or 0.11% per month, prior to taxes and the 8% Provincial Rebate. Business rate information can be found here. Download our Residential Rates Brochure. Residential Rates in effect between November 1, 2018 and December 31, 2018. 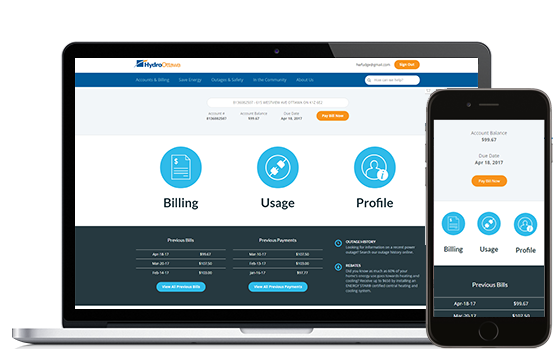 Learn about some of the additional rates and charges that may appear on your bill. 1. The Ontario Energy Board (OEB) sets the residential and small business rates for electricity under Ontario’s Regulated Price Plan or RPP. The OEB reviews and adjusts these rates, if required, twice a year: in the summer (May 1) and in the winter (November 1). The vast majority of Hydro Ottawa customers pay Time-of-Use rates. If you are a Tiered price customer, please visit oeb.ca for more information. 2. The Delivery Line Loss Charge is calculated by multiplying the Electricity Charge Consumption (per RPP Category) by the loss factor and then multiplying this number by the current month’s Electricity Charge under the RPP rate. 3. For customers who do not purchase their electricity from an electricity retailer, a monthly administration fee of $0.25 is added to the regulatory charge to recover a portion of the cost of systems required for the market. 4. The rebate will be equal to the provincial portion of the Harmonized Sales Tax (HST) on electricity bills, representing an 8% savings.